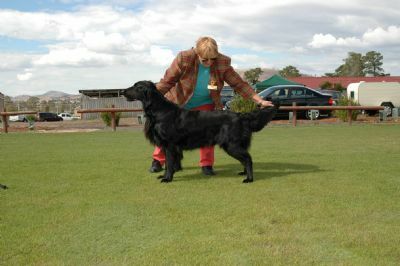 Grand Champion Bushman The Deputy had a successful show career, initially in Victoria with Bushman Kennels, and in Tasmania since his arrival in July 2001, where he was part of the Firebush team of flatcoated retrievers. He was a consistent class in group winner. The highlight of his show career was winning Best In Show at the Tas Ladies Kennel Club Championship show on 23 April 2005, under the late Judith McMurtrie. He followed that up the next day with a runner up in group under Marie Merchant. In 2005 he qualified for the 2006 Contest of Champions which was held on 11 March 2006. 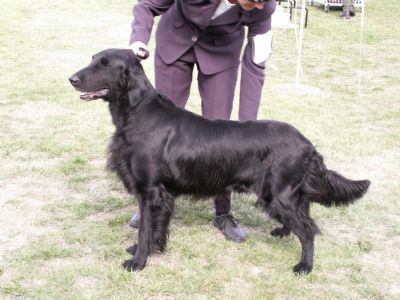 He was a lovely dog to live with and had the outgoing flatcoated retriever personality. 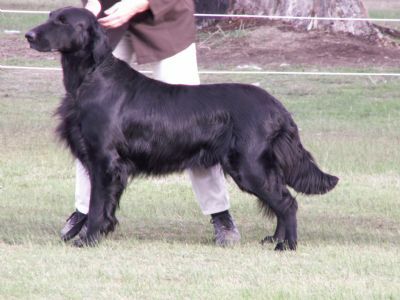 Deputy achieved his grand championship in May 2008. Sadly we lost him to suspected snakebite on 26 September 2008 at 8 years of age. We miss him very much. Thank you to Bushman Kennels for allowing this lovely dog to be part of our lives for the last seven years. Deputy's spirit lives on in the eight lovely puppies he sired to Bushman Dream Come True in November 2006. We kept Ch Firebush Dizzy Miz Lizzy and her sister Firebush Let It Be.